Nature and Culture International plays leading role in protecting cultural and biodiversity in an area rapidly losing its forests. 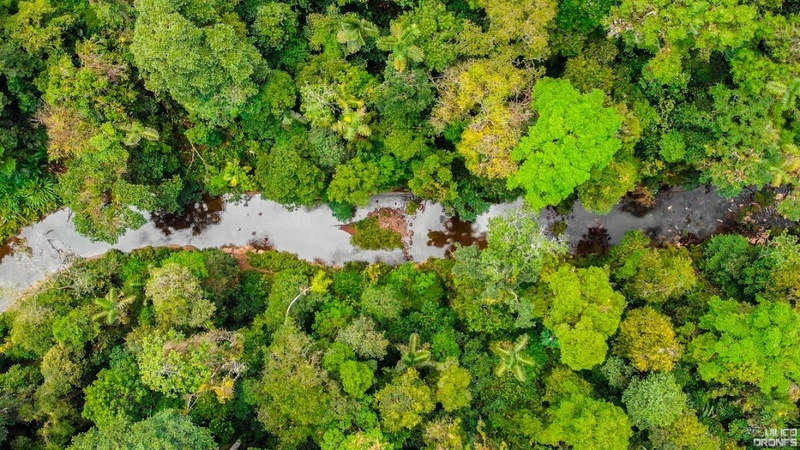 Nature and Culture International celebrates the creation of a new protected area linking the Andes Mountains with the Ecuadorian Amazon. Huamboya Municipal Conservation Area safeguards priority ecosystems and cultural diversity in central Ecuador, adding to a network of protected areas in the region spanning 7.5 million acres. Huamboya protects 103,082 acres of sub-tropical montane forest* along the eastern slope of the Andes Mountains. In recent years, this region has suffered extensive deforestation due to agricultural development – an estimated 47 percent of the Huamboya Municipality has been converted to pasture and croplands. This new area eliminates a significant unprotected gap between Sangay National Park and other protected areas, namely Pastaza Provincial Reserve and Río Upano Municipal Conservation Area. *Sub-tropical montane forest is a major natural habitat found in the Andean region, occurring in a zone from about 1,200 to 2,400 m. It serves as an important bird habitat. 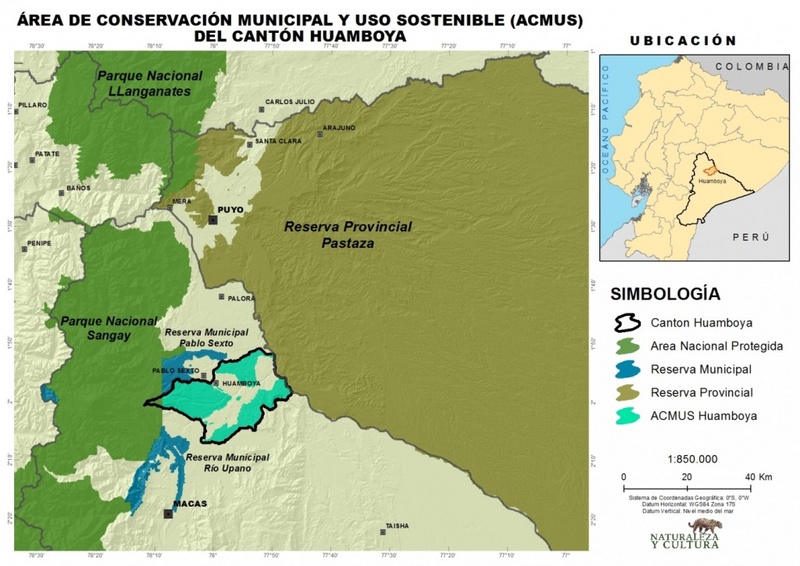 In linking protected areas, Huamboya establishes habitat connectivity essential for the long-term survival of such far-ranging species as the vulnerable spectacled bear (Tremarctos ornatus), lowland tapir (Tapirus terrestris) and near threatened Jaguar (Panthera onca). The area is also an Endemic Bird Area with 36 range-restricted species, including the vulnerable Ecuadorian piedtail (Phlogophilus hemileucurus) and near-threatened wattled guan (Aburria aburri). Ranging between 2,000 to 5,600 feet above sea level, Huamboya fills an elevation gap in the country’s national protected area system; the four national parks on the Ecuadorian east slope are generally higher than 3,000 feet above sea level. 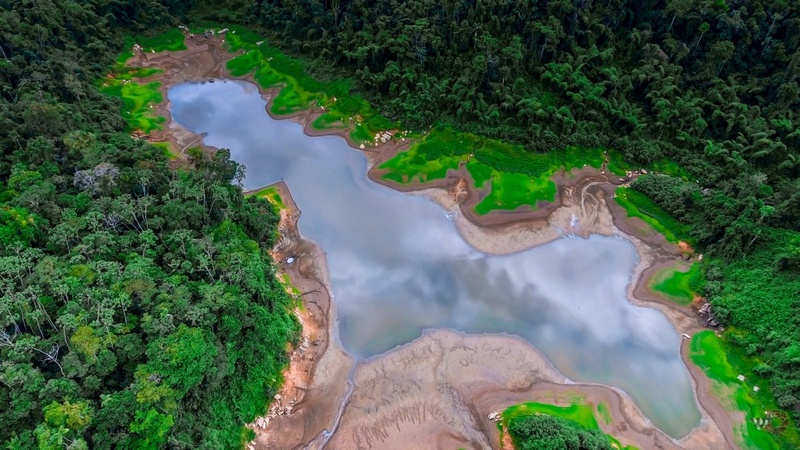 To date 586 endemic plant species – or species found nowhere else on the planet – have been recorded in adjacent Sangay National Park, or approximately 20 percent of Ecuador’s total. Based on proximity, scientists estimate that Huamboya also has a high level of plant endemism. Nearby communities rely on water that flows through the area for drinking, agriculture and other activities. Protecting the area will safeguard water supplies from outside threats as well as prevent droughts and floods, both of which are becoming more common with climate change. Huamboya will also preserve the home and ancestral practices of a significant indigenous population, principally members of the Shuar Nationality. Huamboya Municipal Conservation Area is a result of collaboration between Nature and Culture International, local communities and the Municipal Government of Huamboya. The area was created with the generous financial support of the Andes Amazon Fund. With your help, Nature & Culture-Ecuador will continue to collaborate with the community and municipal government, developing and implementing the area’s Management Plan to ensure effective and lasting conservation impact. Check out this video to learn more about this incredible area.